People seem truly baffled by the fact that we are raising a child aboard a boat. We encounter a lot of confusion and genuine curiosity about how (and why) we are doing it. (Where does the baby sleep? What about her toys?). In the end, I have no doubt that, after discussing our baby-on-board lifestyle with people, many suspect we're a bit "off" in terms of our mental stability. Fair enough, but however crazy you might think we are, I can now, with confidence, say that I feel the same way about you if you are, in fact, someone who has elected to raise a child in a house (unless your house has only one room...if that is the case, you're golden). We recently spent some time with Helina at her grandparents' house, which allowed me to experience what it would be like to raise and wrangle a toddler in an actual house. I have to say, after comparing the two dwellings, there is no way I would willingly choose a house over a boat. Based on Helina's short stature, a traditional staircase is the equivalent of a mini mountain--one that beckons her to scale its Berber-coated terrain. While at her grandparents' house, a good deal of my time is spent either carting Helina up and down the staircase or spotting her while she crawls up the steps. I also spend every other moment in which I am not doing one of the aforementioned activities worrying about whether or not Helina is climbing the stairs without my knowledge. I guess that is why those rickety little gates were invented (I sure do hate those ugly little gates). I know, I know. It it both illogical and inconsistent for me to be concerned about swimming pools given the fact that our home is literally surrounded by (and partially submerged in) water, but I am. Much like staircases, swimming pools call my child's name. Although she is completely dismissive of--perhaps even bored by--the water in our marina, she has an uncontrollable urge to touch pool water, feel its lukewarmness, and smell its chlorine. 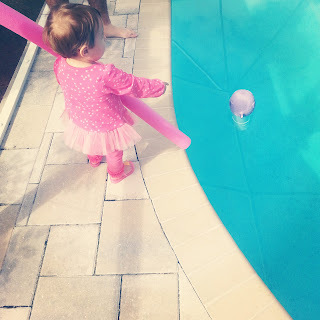 Here she is directing a rescue mission to save a darling little "oc-ta" (aka a floating chlorine dispenser resembling Helina's octopus bath toy) that, tragically, managed to strand itself within the waters of a residential pool. You: Why are you doing that? You: That belongs to the dog. You: Do NOT eat that! You: That is truly disgusting. You: I can't believe you just ate that. You: I'm gonna be sick. You: Do not touch that! You: Hot, I said Hot! You: You are making mommy crazy!!!! This scenario has never once happened in our galley. I always tell people that the only luxury we don't have aboard our boat is space (well, that, and a dishwasher). I will never again make such a comment, as I no longer view space as a luxury. Quite the opposite. Space is actually a major source of worry. Whenever we are in a house with Helina, I constantly find myself asking, "Where's Helina? Where's Helina?" In a blink of an eye, she is able to magically disappear. On our boat, we never have this problem. I always know where my child is and I always know she is safe. Thankfully, when we're at Helina's grandparents' house, there are two additional sets of eyes watching her (although we could use about 10 additional sets on top of those, plus a few cameras, heat sensors, bells, and whistles). Needless to say, we won't be buying a house anytime soon. And, now that I know what I'm missing, I strongly encourage new parents to consider adding "boat" to their registry. To say that one waits a lifetime for his soulmate to come around is a paradox. People eventually get sick of waiting, take a chance on someone, and by the art of commitment become soulmates, which takes a lifetime to perfect. See the link below for more info.